As much as they are the stuff of legendary online debates, they are even more polarizing in the field! Take your time with these “Tiny Tim’s” and be sure to assemble a suite of ID features when making your case for an ID. What to focus on: we note the bird’s large, blocky head; pale grayish cheek and nape; dark cap; and graduated tail feather length (just above the copyright symbol, we see the tip of the outermost tail feather and we see that it’s quite a bit shorter than the adjacent tail feathers). We back up and see that collectively, it is of a lean, lengthy build. 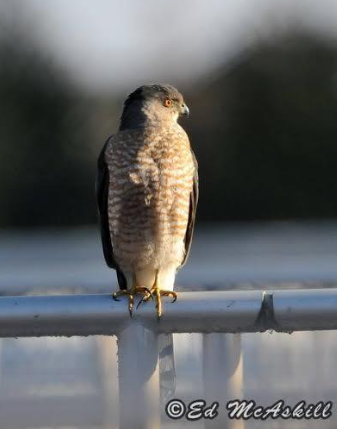 It is at this time that we now begin to input the bird as Cooper’s Hawk in eBird while our birding friends are still frothing at the mouth about the bird being a Sharp-shinned. Water on a Coop’s back….you got this. Pitfalls to avoid: don’t give its micro tarsi too much ‘weight’ in this ID…in fact, this only confirms that the specimen is especially dainty. Also, I wouldn’t concern yourself with using items in the picture for a sense of scale…unless that item is ruler….held vertically! The latter pitfall is a great way to lose focus on the things that really matter….esp. with a bird posing as nicely as this one. Photo: I thank Ed McAskill for allowing me to showcase his excellent capture of this tiny specimen! At this distance, the bird appears to have a dark cap and gray cheek. Thin, tubular body lacking the bulky chest tapering to a thin waist build of a Sharp-shinned. 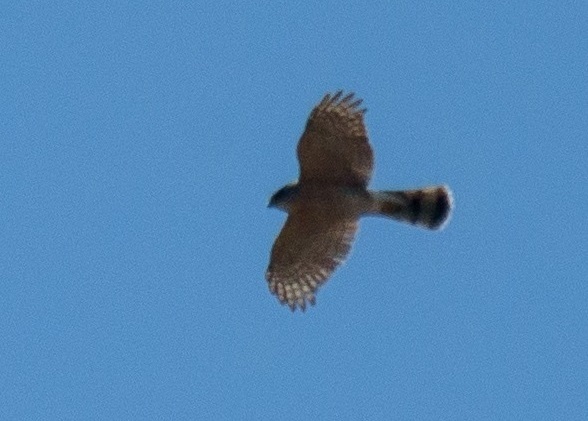 The head is quite large and projecting past the leading edge of the wing in a soar (not an absolute ID point as larger Sharp-shinned Hawks can show this, as well). A proportionally very long tail on the body lacking the noticeably thin tail base as seen with Sharpies. The rounded tip when the tail is splayed, plus the prominent white terminal band round this bird off. Photo Credit: Don Wigle. Greenland Road Hawkwatch near Ottawa, Ontario on 14 April 2015.